Verdict – “Jai Ho is contemplative, but tedious in it's approach and composition”. I'm surprised when Jai Ho kicked off with a groovy EDM song, believed that it would be a surprising cliche-less entertainer. But that's just me assuming something that would never happen. Thank you Salman Khan. Thinking far too beyond, there is nothing inside to enlighten the plot. It's just Salman portraying his normal Being Human character who emerges with a noble idea, which was only effective on paper. Everything beyond this minimal initiative was just a mixture of commercial elements which includes Salman's throbbing roars and massive punches. Talk about an obtuse witless screenplay, Jai Ho is a perfect example. Enormously layered with repetitive cliched scenes dealt with a social message, the story completely rushed with absolutely no development in it's approach which didn't really intrigue me even when it's playing safe with melodramatic ingredients in the first half. Taking an immense turn with the introduction of an under developed villain, things started to make no sense whatsoever which ultimately leaves everything to Salman being the only hope for the humanity. Considered as a movie for the masses, Jai Ho was even a huge mess when it tries to be commercial, over-the-top dumb action sequences, unamusing humour and impervious emotion was not pretty easy to take in. Well shot with an impressive gorgeous canvas at times, the cinematography was tremendously outdated with it's retro zoom-in and zoom-out approach which is obviously terrible to look at. Debutant Daisy Shah was decent with her performance, her character was hardly there for 20 mins in the movie similar to the other supporting actors namely Tabu, Danny Denzongpa, Pulkit Samrat and Sana Khan. 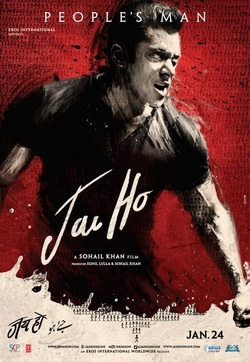 The centre lead Salman Khan was not surprising for the most part, his terrible expressions during the action sequences and not so emotive appearance during the sentimental scenes are completely flat and was definitely a let down. Nevertheless, Jai Ho tries to be a game changer with a strong social message, but was hugely misleaded with it's dreary screenplay and in-your-face commercial elements. It's definitely far away from being another blockbuster remake, but may entertain Salman's fans who don't really care about watching a well made movie. If you're not a supporter of the big guy decline it completely and save it for a rainy day rental. Yaariyan is the directorial debut of Divya Khosla starring Himansh Kohli, Rakul Preet Singh, Aditya Raj Singh and Gulshan Grover. 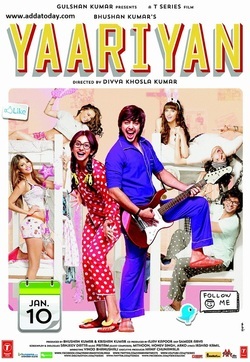 Yaariyan is about a group of five friends who are chosen by the Principal to save their college from an Australian businessman. They have to take part in an inter-college competition against the Australian students, if they lose they will have to give up a portion of the land to the businessman on which he will built a resort or something. These five friends are the last hope to save the college from the evil businessman. The plot mentioned above is passable. It can be made into an entertaining popcorn movie but because of the awful script, directing, acting, screenplay and all the other technical aspects the movie turned out to be a complete disaster. No dialogue and situations in this movie makes sense, it actually is pretty laughable. There is not a single well written, well acted character in the movie. While we are at that, let’s talk about the characters in the movie. The main protagonist Lakshya is an obnoxious, lazy, desperate and childish guy who has no direction in his life. But when the movie requires him to be a hero, to motivate other people, to climb huge mountains without any preparation, to ride a mountain bike and defeat the highly trained Aussie player, to cheat on his team because of his desire to study in Australia after the Australians killed his best friend, he will simply just do it out of nowhere. The actor who plays Lakshya is immature and annoying. All the rest of the characters are forgettable and has no back story whatsoever. You simply just do not care about anyone in the movie. The performances are terrible! And hence we shouldn’t waste our time talking about them. The direction, as I said, is completely awful. There are a lot of continuation, pacing and editing issues in the movie. The only good thing about the movie is its music. Yaariyan might do well as an album with its catchy tunes and one of the songs really stands out, which is ‘Barish’. To sum it all up, Yaariyan is terrible and a senseless movie. It literally makes no sense at all with its laughable script and bizarre ending. If you thought Student of the Year was a bit over the top, wait till you see this movie. I advise you to skip Yaariyan and instead sit at home and watch something else on DVD. Yaariyan is the worst movie I have seen in a very long time. I give it one out of five stars. Chacha Chaudhary, Baadshah, Jagga Jasoos and Gopichand after all these popular and successful detective genre films in India. God knows what striked Director Sameer Tiwary's mind as he decided to make Mr. Joe B Carvalho. In the film, Arshad Warsi plays a role of a detective and a watchman, who is only hired when someone wants to have a watch on their Doodhwaalas. How awkward! The movie tries to entertain you with it's comedic elements in which you don't feel like laughing on the punches, but you tend to laugh on the actors silly acting skills who are awful and delivering their comedic punches. The music of film compliments the story, so watching the movie the only one word comes from your mouth is "Bakwaas". Take it as a compliment! The movie also doesn't have much content or masala in it. Due to some suttle Tom & Jerry comic scenes and Arshad Warsi, Javed Jaferi's intelligent screen presence makes a little some part of the movie quite entertaining (nominal level) and the other part of the movie doesn't makes any sense and hence I'm gonna go and rate this Sameer Tiwary's movie a poor one point five out of five star. On a sidenote, instead of Joe B Carvalho the title of the film should have been Time Waste Carvalho. Dhoom: 3 was written and directed by V.K Acharya and is the biggest and the overpriced instalment among the Dhoom franchise starring Aamir Khan, Katrina Kaif, Abhishek Bachchan and Uday Chopra in the lead roles. December 20, 2013. After buying the ticket for the movie and utilising the remaining pennies for petrol I reached the theatre creating Dhoom on the road. On a funny note, Malang song in the movie had cost too much for the producers, that now they don't even have the money to buy a bullet for a gun. And hence the film which is being called an action thriller had only two bullets to shoot and also suffers with zero fight scenes. Also for all the folks who had previously watched the Hollywood movie 'The Prestige' and still went to watch Dhoom 3, then Bollywood's prestige will definitely appear in front of your eyes. The film's screenplay was too slow and you could easily go watch Dhoom 1 & 2 in between two scenes. And yes, for all the ones who are searching for a story in the movie, you will directly get to hear it from Director Vijay Krishna Acharya "Story dhundhne walo, tumhari aisi ki taisi". And it also seems like Katrina Kaif is a free bird after her breakup with Salman Khan, no extra clothes and definitely no extra shyness. Also, it's better if I write only few words about Abhishek and Uday Chopra cause their role in the film was minimal. Aamir khan does a fine job as Samar Khan but after every fifteen minutes he gets an attack just like his previous film Ghajini, after which his acting turns to overacting. The only thing which impressed me the most was Jackie Schroff's acting and the background score. And those were the only few reasons I'm gonna go give this movie a disappointing two point five star. It remains as an easy one time watch. A.C.P. Jai Dixit and Ali are back for the third instalment of Dhoom, this time, to catch the clown-thief Sahir played by Aamir Khan. The writer of the first two Dhoom movies now sits on the chair of the Director. Sahir is a circus entertainer of The Great Indian Circus along with the show’s co-star Aaliya (Katrina Kaif). In the past, the circus was shut down by the bank and could not fund it anymore no matter how much they pleaded. Sahir’s magician father could not handle this humiliation and takes a very unlikely step which ruins Sahir’s life. Now Sahir is back to avenge his father and shut down each and every branch of the bank. He has only one goal in his life and that is to destroy the bank which destroyed his father’s life and the circus. The premise of the movie is very interesting but the movie could not hold the interest for too long. It seemed like every scene was dragged a bit and there are a lot of pacing issues with the movie, especially after the intermission. The chase sequences were cool but even they were dragged and you just want them to end soon. The movie was not going anywhere, for the first half of the movie which really bothered me but many of the things made a little sense right when the second half begins. There are a LOT of cheesy scenes and dialogue in the movie which could have been handled a lot better. Now, let’s talk about the acting in the movie! Aamir Khan does a really great job as the clown-thief. A few of his scenes really stands out. This is not his best acting though, you will be a little dissatisfied by his acting but still, he had done a great job. Katrina Kaif acts as an eye-candy for the viewers. There’s no doubt that she is one of the most beautiful actresses today. She has a very brief screen time although she didn’t have much to do in the movie. Abhishek has the same limited expressions as he did in the previous two movies. There’s nothing new with his character and the same goes for Uday Chopra. He has some quirky and funny dialogues which act as comic relief. He didn’t have much to do in this movie either. This was completely Aamir Khan’s movie! The cinematography is top-notch in the movie. The movie looked great. The visual effects in few scenes could have been made better but this being a Bollywood movie, it’s passable. The direction was just okay. Some of the actions sequences were shot very well. There was a slight problem with the editing in a few scenes. That could have been easily fixed and then the transition between those scenes would have been smoother. All in all, the movie is a lot of fun as long as you do not think too much during it. Some of the action sequences really stands out in the movie and are enjoyable. This movie would have been a lot better if it had better writing and better direction. Also, the movie is three hours long, so be prepared. This is my least favourite among the Dhoom franchise, but still is a good time. If you loved the previous Dhoom movies and want to see more of the action, I recommend you to watch Dhoom 3. Jackpot starring Sachin Joshi, Sunny Leone and Naseeruddin Shah in the leads is a thriller drama directed by Kaizad Gustad who had previously done few awful films which do not need a special mention. December 13th is the time when winter assembly meetings are held in India, through switching to my regular routes and getting chased by several cops I finally reached the theatre to win the 'Jackpot'. With all honesty, Jackpot is a film where jackpot's fluke is even more worse than the "Maharashtra rajya lottery" bumper inaam. But being considered as a newfangled thriller drama, Jackpot is nothing but a unabashed rip-off to Ladies vs Ricky Bahl but with a cheaper version of Ranveer Singh and Anushka Sharma. The movie doesn't contain any sort off adult content except for Naseeruddin Shah's age and I wonder why it's even given an A certificate. And that's the difference a single name could make (If you know what I mean!). Nevertheless, the movie has got nothing to do with gambling, jackpots, acting or film making and quite often with all the characters in the movie portraying professional con men, we the general audience are fooled big time, the movie doesn't worth any of your time and money and that's the reason I'm gonna go give this movie a poor one star. PS: I've watched this movie under expert guidance, so please don't even try to watch this movie at theatres or in home. Director Prabhu Deva's recycling factory presents R..Rajkumar starring Shahid kapoor and short gun Sinha's broad gun daughter Sonakshi Sinha. 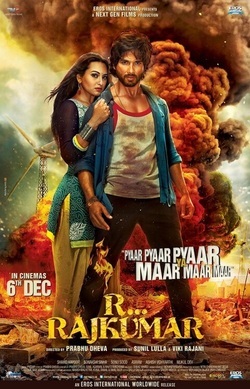 R..Rajkumar a film through which an actor who was literally the first crush of all my female friends surprisingly impresses male audience this time, with his tuff looks and acting skills. Through his desi akhaade wali body and desi accent wala andaaz villain Sonu successfully impresses all of us with his Sood (interest). Sonakshi Sinha, well I seriously don't wanna comment on her, but I'm sure after this film the original Rajkumar saab will say "Arrgh! mohtarmaa apne paiir zameen pe mat rakhna warna tumhare weight ki wajah se zameen dubb jayegi"
The film has many loopholes and issues but I must say this film is a perfect combination of rambo level ka action and Rajkumar level ki dialogues. Credits to the director Prabhu Deva. The film certainly doesn't have any Wanted or Rowdy waali acchi baat but yeah it certainly have Ramaiya Vastavaiya waali gandi baat. It's any easy one time watch warna aapke mooh se bhi niklegi "gandi baat". Saif bhooka toh 'Kal Ho Naa Ho', samjha toh 'Omkaara', aur agar bigdaa toh 'Bullet Raja'. 29th November 2013 I kick started my bullet and vroomed towards the theatre in bullet speed for Bullet Raja. The moviefeatures Saif Ali Khan who's playing the role of Raja and Sonakshi Sinha who's portraying the 500 cc bullet bike. Bullet Raja is a film where the Nawab turns into a Raja misra, who says "Jab hum aayenge toh garmi thodi badh jayegi" but let me tell you in this winter season his acting and the direction of the film doesn't make you feel "Garmi", yeah but the man who is playing second lead in the film, Jimmy Shergill, does make you feel warm by his "Sigdi" of talent. By the time the film looses it's direction and the ultra slow speed makes you fall sleep, then you will witness a powerful and an impressive performance from Vidyut Jamwal which will surely charge up your body with "Vidyut" energy (electrifying energy). Due to some punchy dialogues and an interesting story line, this film could have been a great one but Tigmanshu Dhulia! "Yeh tune kya kiya, Apne he kiye karaye ko dhool mein miladiya?" The direction was very poor and pointless. Sonakshi Sinha! I really don't wanna speak anything about this girl or else her father will shout at me saying "Abey Khamosh". I'm sure due to the appealing trailer all you guys may have the intent to watch the movie, but don't you dare to do that, cause The Raja is not a powerful ruler and The Bullet doesn't have any kinda pick-up. And that's the reason behind I'm gonna go give this film a disappointing two star. Verdict: “Gori Tere Pyaar Mein is reasonably entertaining in parts with a few good moments”. 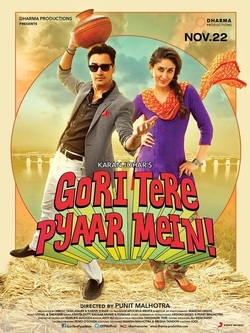 Gori Tere Pyaar Mein is directed by Punit Malhotra starring Imran Khan, Kareena Kapoor, Anupam Kher and Shraddha Kapoor. It is a Romantic-Comedy revolving around two characters Sriram Venkat (Imran) and Dia Sharma (Kareena). Sriram is a self-centered shallow city jerk who doesn’t value his family and relationships and Dia is a NGO worker who wants to make a difference in the society in her own small way. The first half of the movie is mostly in flashbacks with Sriram narrating his story of, how he met Dia and how their relationship took a wrong turn, to his fiancé Vasudha (Shraddha Kapoor). Whereas the second half of the movie completely takes place in Jumli village located in Gujrat where Dia has taken up residence and Sriram has to win her back by constructing a bridge for the village by using his degree in Architecture, which would make it easier for the villagers to cross the river. The main flaws with this movie are its story and its weak screenplay. It doesn’t hold the audience’s attention and eventually you may end up getting bored towards the end. Imran tries to maintain a certain charm through the entire movie which is appreciable but Dia’s character is very underdeveloped. A little more back story for her character would have made her a better character. The music by Vishal-Shekhar is enjoyable, though I think most of the songs should have been cut from the movie since they doesn’t match the situation of the characters at that moment, especially in the second half of the movie. On the whole, Gori Tere Pyaar Mein has an interesting first half but the second half lets the movie down and does not go well with its first half. The direction and performances are just okay, the music is good and so is the cinematography. If you do not have any work to do this weekend, you can check it out or else you can watch it on DVD after a few months which according to me is a better option here. Verdict: “An exquisite and a perplexing movie with performances and cinematography as it's main strength”. Love can be stated in numerous ways, it can be impractical or overwhelming, silly or remarkable. But it all hinges on the director, the way he portrays the emotion or sentimentality and magnetize you with his clever conception. Inspired from the classic Romeo & Juliet, SLB narrates the movie in a diverse manner which takes place in a illusory world where people are aggressive in nature and ferocious in their acts. Regardless with the fact that they belong to different communities, Ram & Leela fell in love with each other and discover amorousness in every meet. However, things usually go tremendously wrong which compels them to take erroneous decisions. Nevertheless, an inspired customary plot didn't add something novel and fresh for us to think upon. But it's definitely the on-screen performances and the artistic presentation which made me pay my full attention to it. What really enamored me the most were the performances from the leads, Ranveer & Deepika were phenomenal in the movie. Their fervor and the amount of commitment they put in every single scene was appealing to stare at, also the chemistry between the two really lifted up the movie to another level and is undoubtedly one of the most superlative performances I've seen in recent times. Known for using flamboyant colors in his narration, SLB re-created the magic and astonished me with his immense film making skills. Every single frame shot by the cinematographer Ravi Varman expresses it's desire and fascinates you as a viewer. Each and every costume, article and items used were examined and presented really well whic fits into the perfect mood. And the set designs were quite incredible too. As per my issues about the movie, it was quite confusing on it's approach, the sub plots and other predictable twists didn't make much sense. And the two and half hour length of the movie certainly tests your patience, as you may not get invested as much they want you to. To sum it up, Ram-Leela is a gorgeous looking movie and is a great example of remarkable film making. Despite it's issues, the performances and the vivid cinematography gives you an astonishing cinematic experience only if you're patient with the movie. PS: Do watch it in a biggest screen possible with perfect picture quality and sound.